Synergised expertise have enabled us to come out with an innovative solution for Algae attack protection and Sea Lice treatment. We have gained a remarkable position in the concerned industry by offering a distinguished range of PE Tarpaulin. Our offered PE Tarpaulin Sheets are manufactured using advanced machine in order to maintain their adherence to universally accepted norms. 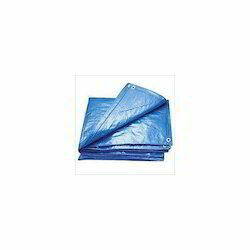 The PE Tarpaulin offered by us are highly demanded in various purposes. With the great advantage of light weight, heavy tensile strength, excellent water-proof and exceptional low-cost, Plas-Tarp is widely used in areas like agriculture, construction, leisure and protection purpose. We are engaged in manufacturing and supplying a wide range of HDPE Tarpaulin. Our tarpaulins are rust proof, wax processed and offered in blue color as well. We offer our clients an extensive range of Hdpe Tarpaulin, which is reckoned for its durability and extreme resistance to water. With our years of experience and knowledge, we are offering a wide range of Tarp Sheets. Our customers can be easily availed from the market at attractive prices. Offered range is manufactured using high grade fabric & advanced methodologies by our experienced professionals. Color: As per client request . We are one of the leading providers of a range of PE Tarp . These fabrics are generally used in vehicular protection, industrial storage, backing of carpet/tufting and wall covering purposes. The industries that this fabric is widely used in range from steel to paper, from textile to cement and from automotive to machinery and polymers. It is also used in certain agricultural applications to protect sensitive crops from harmful UV rays. We are suppliers and installers of HDPE Geomembrane, HDPE Sheet, Polyethylene Film and PE Tarpaulin, Cotton Canvas Tent and UV Film for Green House. PE tarpaulin are widely Used for truck canopy, ship, cover and cargo storage or transportation in mineral factory and ports, also can be used as tents in outside , travel and calamities, the tarpaulin is to cover and protect the goods in the open air.